Janani has a Bachelor’s degree in Architecture from India and a Master’s in Lighting from the Lighting Research Center in Troy, NY. She started her lighting career as an applications engineer at Elliptipar, where she first got introduced to AGi32. She moved to Calgary, AB in 2005, where she worked for a couple of years at Stebnicki + Partners. 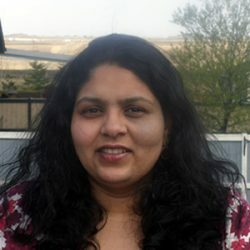 Janani currently works as a freelance lighting consultant in Calgary. She has over 11 years of experience with AGi32 and enjoys exploring new features of the software. She is Lighting Certified, is a member of the IESNA, and has taught the lighting calculation portion of the ED 100 and ED 150 courses in the past. Janani’s kids take up every available moment she has when she is not working. Luckily they’re adorable, so it all works out.